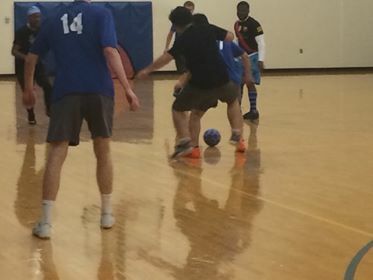 Every Thursday in the Community Center, A soccer league is being held inside one of the multi-purpose gyms. There are eight teams, competing four versus four in two, twenty minutes halves. In the first game of the week, team six went up against team eight. The game was intense players falling and getting tripped constantly while trying to get the referees to call something. At half time the score was tied at four to four, but then team eight pulled ahead, ending the game twelve to eight. The second and third game wasn’t as exciting ending with twelve to five and twelve to six. The final game was where it picked up in intensity again as team four and five are considered “two of the best teams in the league” by the referees. This game, like the first, was physical. As they scored back and forth, players were tripped and pushing, in highly competitive play. At halftime the referees were trying to figure out what to do if they tie at the end, resulting in a shootout. Luckily team five pulled away with a good lead, ending the game ten to seven.